Over 98% of the human genome contains non-coding DNA sequences. For many years molecular biologists referred to this component of the genome as the "junk" DNA since it does not code for any "useful" protein product. Over the last years this notion changed significantly as scientists discovered that a large part of this DNA contains various genomic elements that have important roles in cell physiology. Genomic elements such as non-coding RNAs, transposons, splicing RNAs, DNA repeats and others were shown to play a significant role in regulating gene expression. In addition, all these elements were implicated to contribute in the pathogenesis or progression of various human diseases. In this book, the editor will attempt to describe all these genomic elements that constitute the junk DNA of the genome. For every genomic element, the physiologic role in the organism, its role in evolution and any possible involvement in human diseases will be discussed. Additionally, interaction between these elements in normal or pathologic condition will be discussed. 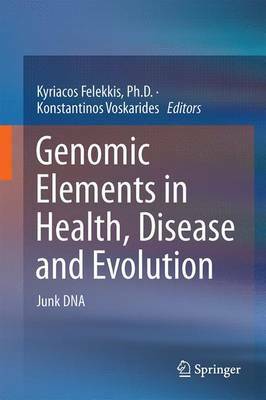 Since a large amount of new knowledge is generated daily in regards to these genomic elements, this book will attempt to combine all the information in a single publication that can serve as a reference for future studies. The first part will discuss RNA elements such as microRNAs, long non-coding RNAs, piRNAs and splicing RNAs. The second part of the book will deal with transposons, retrotransposons and DNA transposons. Finally the third part of the book will discuss DNA elements that include DNA repeats, conserved non-coding sequences, distal genomic elements, introns, pseudogenes, CpG islands and telomeres. For miRNAs and CNVs a separate chapter will be dedicated to their role in human diseases since an extensive amount of information exists about these two elements.